Victory! We raised the minimum wage! I am so proud of what we have done together. Yesterday, a landslide of 81% of Oakland voters voted YES to raise the minimum wage to $12.25 with paid sick days so that 48,000 families can put food on the table and 57,000 workers can stay home when they are sick without losing wages. This is huge. Thank you. Thank you. Thank you. YOU made this happen! Your voice was part of the tidal wave of public support. And whether you were pounding the pavement or talking to friends and family at the dinner table, you created the groundswell to pass Measure FF. 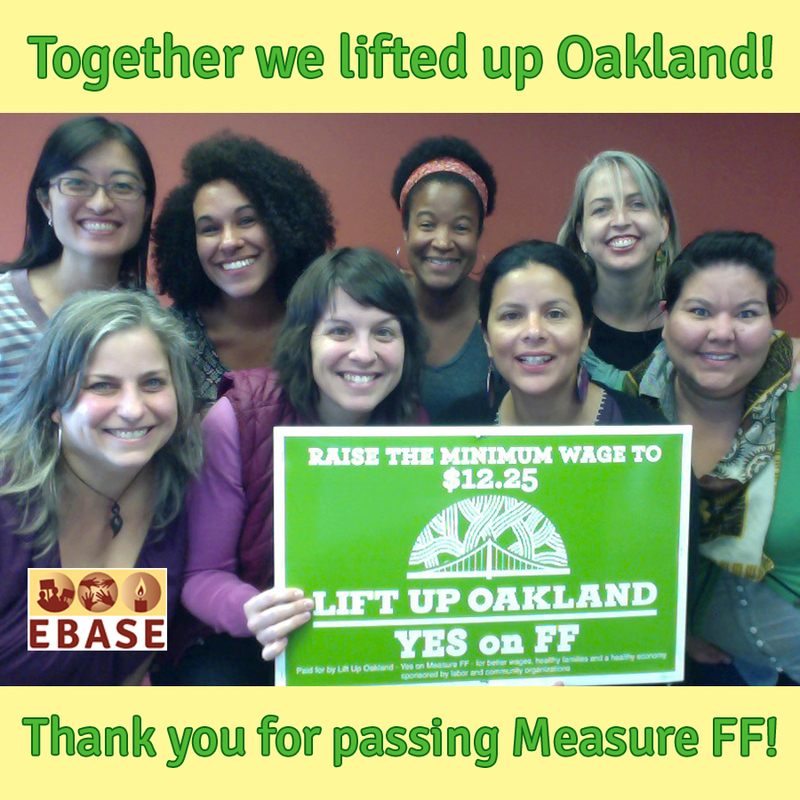 Together, with our partners in the Lift Up Oakland coalition and with supporters like you, we have achieved an incredible victory for Oakland. This is a win for all of Oakland – and so many organizations and individuals came together to make it happen. You joined us on the doors to talk to thousands of voters, including over 10,000 voters educated about Measure FF through our partners at Oakland Rising. You helped us reach 4,000 people in congregations as part of Labor in the Pulpit. You spoke to local businesses to gain their support through our #ShopIn4MeasureFF campaign. And many of you donated to support EBASE and to enable Lift Up Oakland to place targeted media ads and run a Get Out the Vote field operation. And, what is most exciting to me about this victory is that our movement is growing. Like you, I see$12.25 as the floor and Oakland is just the beginning. Our victory sends a strong message to other cities: we CAN raise the minimum wage, improve people’s lives and create the East Bay community we all want to live in. This victory is everyone’s to share, and I hope you’ll stick with EBASE as we continue to lift up low-wage workers and build healthy, strong communities. Thank you for standing with us and for believing another world is possible.